A three dimensional cutting machine, manufacturer rated for products input sized up to 5.5 inches (140mm) in any dimension. Manufacturer recommends for uniform flat or crinkle cuts, for dices, cubes, French fry strips, julienne cuts and slices from a variety of soft ripe fruits and brittle root vegetables, such as potatoes, apples, broccoli stems, citrus peel, papaya, peaches, celery, carrots, and many others; producing clean, uniform, high-quality tons-per-our output. Slice thickness: From 1/8 inch / 3.2mm, up to 5/8 inch / 16mm, (knob adjustable). Crosscut knife spindle spacing: from 9/32 inch (7.1mm) up to 3 inches, (change part). By removing the crosscut knife spindle and / or the circular knife spindle(s), the Urschel GKA can also cut strip cuts (two-dimensional cuts) such as for french fries, and slices (single dimensional cut). Use of flat or crinkle cut knives determines flat or krinkle cut output. 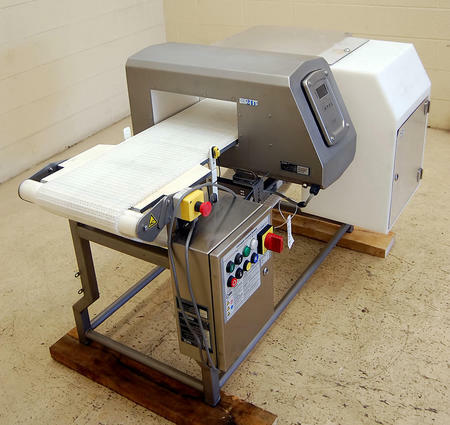 We can complete this machine with cutting parts to fit most standard cutting specifications: CALL 315-589-4511 to dicuss your cut size requirement(s)! Stainless steel slice shell and impeller with 10 inch slice shell opening. All food grade USDA sanitary stainless steel construction including spindles, guards, shrouds and tubular stainless steel frame. 3 HP 208/230/460 volt 3 phase drive. As of this writing, this reconditioned Urschel GKA dicer is in stock, in condition, available for timely shipment. CALL 315-589-4511 to confirm availability, and to discuss your industrial process capacity fruit and vegetable cutting equipment needs. STAINLESS STEEL HIGH SHEAR PUMP / INLINE MIXER manufacturer recommended for a wide variety of applications including mixing, emulsifying, homogenising, disintegrating and dissolving, via single pass continuous blending, series processing, and/or pre-mix blending, depending on user requirements. 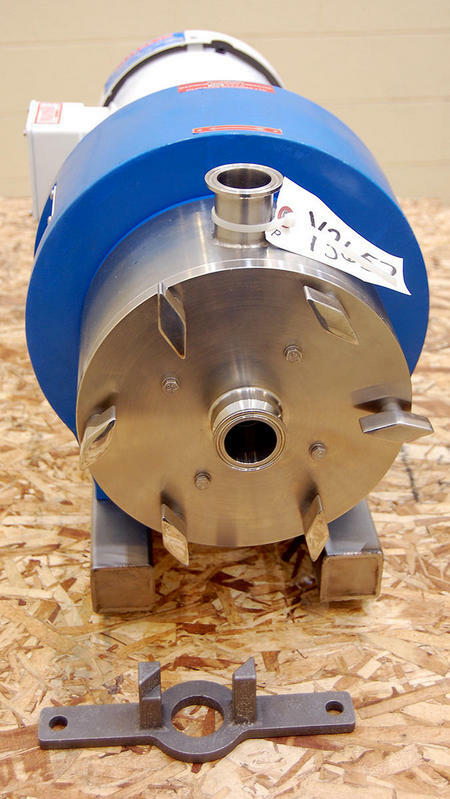 HIGH-SHEAR PUMP / EMULSIFIER configuration can in many cases replace an existing centrifugal pump to provide both processing and pumping benefits. 1.5 inch inlet and outlet with sanitary Tri-Clamp connections. Front center inlet at 8 inch infeed height, top discharge height 14.75 inches. Mixer and motor mounted on tubular stainless steel frame members. 5HP 208/230/460 volt 3600 RPM 3 phase direct drive washdown motor. Corrosion resistant 316 type stainless steel pump-mixer head construction. Food grade sanitary, manufactuerr stamped for USDA / 3A dairy and GMP sanitary standards. Equipped with square hole high shear screen. Provides exceptionally high shear rates ideal for rapid size reduction of soluble and insoluble granular solids, preparation of emulsions, and fine colloidal suspensions. A range of different workheads (stators/screens) are available from the manufacturer for different application needs. Single-pass inline mixing - Hi-shear in-line mixing improves throughput, while avoiding aeration. Series Processing: If a higher degree of homogenisation or comminution is required than can be obtained from a single-pass, it is possible to achieve the required result by recirulation, or by using two or more machines. Pre-mix Finishing: Where ingredients are coarsely pre-mixed in a holding vessel, a single pass through the inline mixer will ensure an agglomerate free homogenous product. As of this writing this high-shear inline blender is in stock at Alard, in like new condition, available for immediate shipment. Up to 3 tons (5,000 kg) per hour throughput capacity, depending on cut size and product characteristics. Input product sizes up to 4.7 inches in diameter. Comes with parts for <>3/8 inch (2mm), <>5/8 inch (15mm) and <>3/4 inch (20mm) cuts. Variable speed with 3 speed selector switch. 208 / 230 volt 3 phase electrical input. As of this writing, this high-volume Eillert Dicer is in stock at Alard, in EXCELLENT operational, mechanical, and cosmetic condition, available for immediate shipment. A semi-automatic tray over-sealer, manual load, vacuum gas-flush for modified atmosphere packaging (MAP), manufacturer rated for residual oxygen levels below 0.1%. Able to gas flush and vacuum seal a variety of tray shapes and sizes. Also capable of atmospheric tray sealing where modified atmopsphere is not required. Manufacturer rated for up to 10 cycles per minute (1, 2, or 4 packages per cycle depending on tooling). 2 HP vacuum pump with 5 gallon reserve tank. Stainless steel control panel, with color touch-screen control panel, PLC controller, digital temperature readouts, start / stop switches. Safety interlock system on the doors, with two-hand safety activation. Food grade USDA sanitary stainless steel and aluminum construction. The Orics Model VGF-100 is a currently manufactured, and fully supported model for which change parts, maintenance parts, and support are readily available from the manufacturer. (Shown in pictures and video with tooling for) 4 inch diameter round cups. 5.75 inch by 8 7/8 inch rectangular trays. Either of the above change part sets are configured for 2-up / two-package per cycle operation. The operator puts two containers in a carrier that is then slid into place. The operator presses the start switch and the vacuum / gas-flush chamber rises into position under the carrier. Heat seal heads and film cutting blades trim and seal the containers as the sealer goes through it's cycle. As the cycle is completed, the film is then advanced and in position for the next cycle. As of this writing, this tray sealing machine / cup sealing machine is in stock at Alard, in EXCELLENT operational, mechanical, electrical, pneumatic and cosmetic condition, available for immediate shipment. CALL 315-589-4511 to confirm availability, and to discuss your particular M.A.P. food packaging requirements. The Axon iBand is a compact tamper event banding applicator designed to integrate easily with existing lines, on a samll footprint, for industrial food process bottling, and other related applications (e.g. pharmeceutical). Manufacturer rated: for up to 80 containers per minute. Film lay-flat range 18mm-130mm, film thickness range 1.5mm-3.0mm, applied materials PVC, PETG, OPS, PLA. Front loading film configuration for ease of access. 3 inch tubular stanless steel pedestal adujstable for bander height, on a stable base with 4 leveling adjustable feet. 110 volt / 220 volt single phase (standard household current) electrical input, pneumatic / air pressure 80psi, air volume 3-5cfm. Previously used for salad dressing bottles with 38mm caps. 36 inch long by 7.5 inch wide by 9.75 inch high heat tunnel opening. Slotted stainless steel side rails adustable for up to 7.5 inch container width. Mounted on an adjustable-height stainless steel pedestal frame, on casters; complete with a hand crank height-adjustment mechanism. Designed to be placed over your existing conveyor line. 230 volt 3 phase electrical input to heat shrink tunnel. As of this writing, this Axon iBand tamper evident band applicator with head shrink tunnel is in stock at Alard, in very good operational condition, and availble for timely shipment. CALL 315-589-4511 to confirm availability, and to discuss your particular tamper evident packaging needs. A Quadro Model XC high-shear liquid-powder mixer for inline dispersion of powders into a liquid stream, at high concentrations. Similar to a Tri-Clover Tri-Blender hybrid powder mixer. Has a "dual stage reactor" which creates a strong vacuum to pull powders from the feed hopper, and disperse them into liquid for food, beverage, and dairy applications, for high-capacity single-pass inline powder dissolution, mixing wet and dry ingredients into a homogenous blend. 18 inch diameter by 23 inch deep steep-walled conical dry product infeed hopper, tapers to 2 inch diameter infeed. 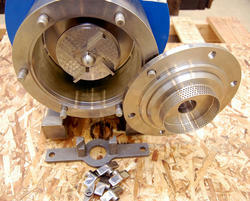 (2) 4.25 inch diameter impellers in blending chamber. The hi-shear impellers are driven by a 7.5 HP 3 phase drive that generates 5400 RPM at the impeller. 1.5 inch liquid infeed, 1.5 inch blended product discharge and a 1 inch CIP inlet all with Tri-clamp connections. 64 inch infeed height, 23 inch discharge height on stainless steel base. 3A rated CIP system for cleaning. Food grade sanitary stainless steel, manufacturer tagged for USDA and 3A dairy sanitary standards. Manufacturer literature recommends for mixing milk powders, whey powders, protein powders, gums and stabilizers cocoa, sarches, maltodextrin, ice cream mixes, drink syrups and concentrates, infant formula, yogurt mixes, liquid beverages, nutraceutical powders, antacids, cough syrups, cell cultures and growth media, gelatin, pigment dispersions, paint, oxides, pigments/stabilizers, coatings, inks, resins textile colors, cleaning solutins, carbon dispersion, and more. As of this writing this Quadro XC Powder Disperser / inline liquifier is in stock at Alard, in very good operational condition, available for timely shipment. 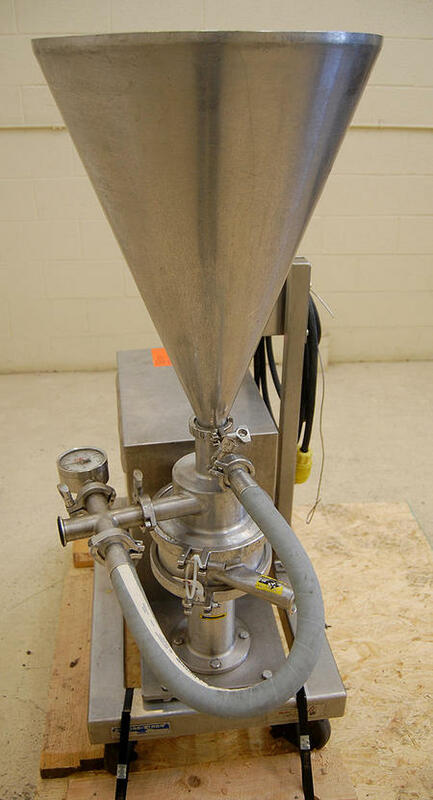 CALL 315-589-4511 to confirm availability, and to discuss your particular blending and emulsifying equipment need. 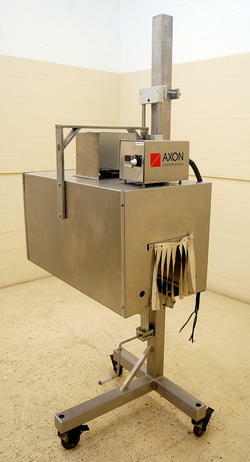 FOOD METAL DETECTOR with BELT CONVEYOR, CEIA THS / MBB, 14x5, 316 stainless steel. 4.75 inch high by 13.75 inch wide USABLE aperture opening with the conveyor belt in place. Integral multi-frequency digital operator search head controls, mounted for a left-to-right product flow direction. 60 inch (5 foot long) long by 12 inch wide stainless steel frame conveyor, with interlocking plastic chain type belt; with wedge shaped 1/4 inch by 1/8 inch perforations in the belt. Equipped with "air blast" reject with catch box 17 inches long by 14 inches wide, with photo eyes for reject verification. Air reservoir for increased air pressure. 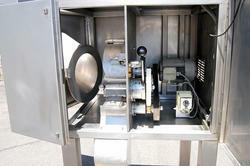 Stainless steel conveyor panel box, with variable speed control, start, stop, emergency stop, and reject reset controls. Emergency stop switches on both sides of machine. Junction box and emergency switches in PVC / plastic boxes. 110 volt single phase electrical input (standard household current). Food grade sanitary corrosion-resistant 316L stainless steel construction. IP65 / 69K light washdown compliant. Operator manual and test wands included. As of this writing, this conveyorized industrial process metal detection system is in stock at Alard, in EXCELLENT operational, electrical, mechanical, and cosmetic condition, available for immediate shipment. CALL 315-589-4511 to confirm availability, and to discuss your product inspection equipment needs. FOUR section through conveyor with 14 inch wide belts:Conveyor belt working height of 28 inches on threaded rod adjustable foot pads. First and second belt sections are 24 inches long, second belt runs faster to create distance between boxes, so only one case is on the weighcell at a a time. Weigh-cell belt measures 14 inches wide by 24 inches long with solid food grade white belt. 24 inch long takeaway belt at discharge. Integrated stainless steel control pedestal with digital touchpad operator control panel with settings for 15 product presets. REJECT system: comes configured with an air blast reject. This model has three diverter outputs to support other / additional reject configurations per buyer specification. Manufacturer rated for line speeds from 20 to 300 fpm, and package rates to 100 packages per minute (depends on package size). Per package weight capacity up to 110 lbs. Displayed resolution to +/- 1, 0.1 or .01 units. Manufacturer recommended for frozen foods, bakery, confectionary, meat and any canned or packaged goods; detergents, chemicals, pharmeceutical and bottled liquid products; as well as manufactured products such as rubber, plastic, metal parts, multi-component parts packages and count-by-weight packages. All stainless steel USDA food grade belt also accommodates unwrapped meats, cheese, or fish applications. Product may be raw, frozen in bags, totes, boxes, cases, barrels, or cans. 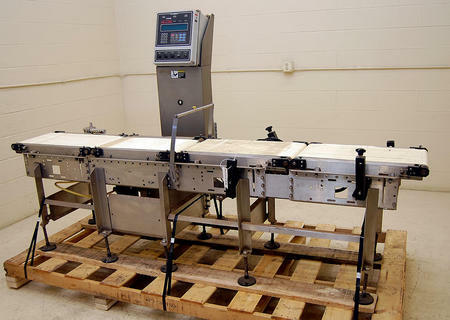 As of this writing, this belt transfer check-weigher is in stock, in EXCELLENT operational, electrical, and mechanical condition, available for immediate shipment. CALL 315-589-4511 to confirm availability, and to discuss your particular product inspection and in-motion weighing equipment needs. 32 inches wide by 102 inches (8 feet six inches) long. 3rd deck 1.5 inch drop to 36 inches long removable replaceable, smooth surface wtih V-ridges and aligning fins. 4 inch high sides at infeed section, shaker bed gets deeper with each deck / section.42 inch infeed height, 34 inch discharge height on adjustable height foot pads. Quick-release hooks for fast / easy changeover of the two removable / replaceable screen sections. All food grade stainless steel including frame. New style Key eccentric with 3 phase drive. As of this writeup, this Key vibrating aligner-feeder is in stock at Alard, in EXCELLENT operational, mechanical, and cosmetic condition, available for timely shipment. Key Iso-Flo DEWATERING SHAKER Y3333 from Alard Equipment Corporation. 16 inch long solid discharge section, where the sides are tapered in to a 28.5 inch discharge width. >=4" high stainless steel side walls. The screens overlap slightly at the steps. Interchangeable screens with quick release screen clamps; --currently fitted with stainless steel woven wire screens with 7/16" square openings. Underside DEWATERING / collection tank measures 59 inches long by 35 inches wide by 14 inches deep, with a 4 inch diameter Triclamp drain connetion at the bottom of the tank at the discharge end. New style Key eccentric with 3 phase belt drive motor with wrench-settable mechanical variable speed pulley. NO LEGS: Before legs, and sitting on the tank drain, this shaker sits at a 28.5 inch infeed height, and 24.5 inch discharge height. As of this writing, this Key vibrating shaker is in stock at Alard, in EXCELLENT operational mechanical, and cosmetic condition without legs, available for immediate shipment for buyer fabrication of legs to suit need. OR Alard can fabricate legs to buyer specification at nominal added cost. CALL 315-589-4511 to confirm current availability, and to dicuss your solids separation, water reclaim and / or fruit, vegetable, or other food product grading needs. Urschel E-TRANSLICER cutting machine, Y3592 from Alard Equipment Corporation on Vimeo. 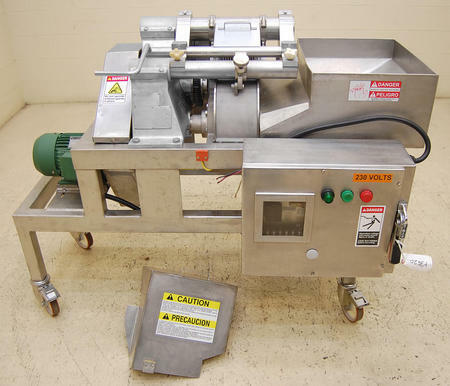 The Urschel Model E Translicer (ETRS) is a a v-belt feed transverse slicer capable of flat and crinkle slices as well as julienne cuts, and is partcularly manufacturer recommended as "spcializing in slicing of elongated products". Manufacture website recommends for slicing cucumbers for pickles, carrots, asparagus, celery, zucchini, leeks, green beans, green onions, leeks, romaine lettuce, jalapeno peppers, banana peppers, kiwi, lemon, pepperoni, cooked chicken tenders, bell peppers, plaintains, sweet potato, pre-cored pre-quartered cabbage, bread sticks, wieners, and other fruits and vegetables. 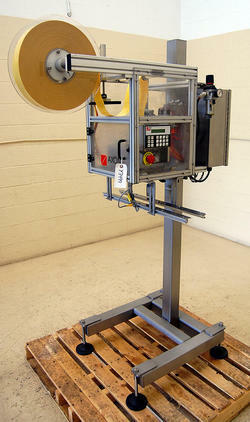 ~ V-belt infeed aligns elongated product for consistently oriented even cuts for coin cuts / slices. ~ Manufacturer rated to accept up to 4 inch diameter firm product, and up to 6 diameter compressible products (may require optional hold-down belt). CALL ALARD at 315-589-4511 for current availability, and to discuss your particular cutting need(s). ~ Manufacturer rated (with suitable cutting parts) from 1/32 inch to 3 inch (.8 to 76.2 mm) flat slice cuts and "coin cuts". Cutting wheels are also available for julienne strips, oval shreds and a variety of "microslice" cuts. ~ 24 blade cutting wheel included. ~ Food grade USDA sanitary stainless steel construction. ~ Runs the same 20 inch cutting wheels as the Urschel Translicer 2000. ~ Stainless steel factory control panel, with interlock safety system disconnects power if safety guards are opened or removed. ~ 3 HP brakemotor cutting wheel drive, 1 HP feed belt drive. ~ VFD variable speed controls for belt and cutting head, with selector switches for easy cutting-wheel changeover. ~ 208/230 volt 3 phase electrical input. As of this writing, this Urschel Model ETRS E-TranSlicer is in stock at Alard, in EXCELLENT operational, mechanical, electrical, and cosmetic condition, available for timely shipment. y3647 kerian size grader ls30 from Alard Equipment Corporation. 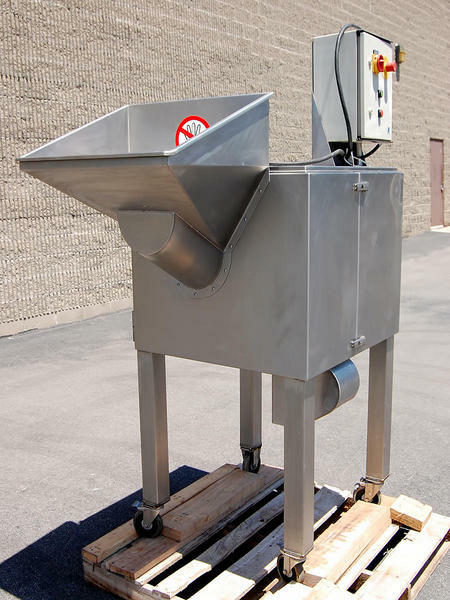 A KERIAN SPEED SIZER, Model LS-30, 30 inch sizing-width model, in stainless steel, with graded / sorted product takeaway conveyor, for separating up to five size grades. 27 inch wide by 7 foot 6 inch long roller bed. Vinyl flaps over the grader bed, that help spread and align product. Openings between rollers ranging from 3/8 inch to 2.25 inches. Product drops through the rollers at some point, depending on size, onto a 72 inch wide by 7 foot 8 inch long graded-product takeaway belt conveyor with adjustable stainless steel lane dividers for (5) grades. The lane dividers can be moved freely to separate five size grades. 43 inch infeed height, 24 inch high product discharge height from takeaway conveyor, on telescoping height-adjustable legs. 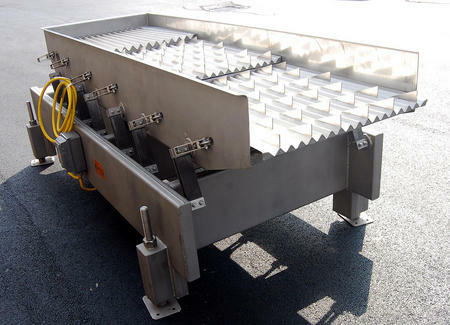 Food grade, stainless steel conveyor bodies, with plastic covered sorting ollers. Variable speed drives on both the roller conveyor, and takeaway, 220 volt single phase electrical input. As of this writing, this Kerian LS30 Speed Sizer is in stock at Alard, in EXCELLENT operational, mechanical, and cosmetic condition, available for immediate shipment.